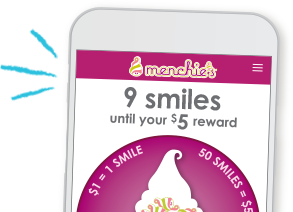 Download our new app today from the Apple App Store or Google Play Store and receive $5 in Menchie's Money and 60 days of double smiles! Now you can track your smiles, pay, order a cake, send gift cards, and more - right from your phone! No dairy, no problem. Our new Cookie Sandwich flavor is made with Blue Diamond Almond Butter. It’s in stores for a limited time only! Our new, refreshing Orange Pineapple Sorbet contains real pineapple and orange juice concentrates. This vegan froyo is mixing for this month only! Embark on the Menchie’s and Missing Link Adventure Sweepstakes for a chance to win a trip to the Grand Canyon! 5 nights, 4 people, hotel, airfare and historic train experience. Treats To-Go. Fro-yo Cookie Sandwiches and Fruit Bars. 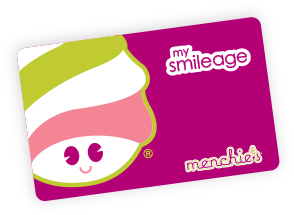 We’re happy to share with you our newest creation - Menchie’s Treats To-Go! Our fro-yo cookie sandwiches come in vanilla and chocolate, and our fruit bars come in mango, strawberry, and coconut. Take home a froyo sandwich or fruit bar and bring some Menchie’s goodness home with you! Our featured April cake has us over the rainbow! Fill this colorful Menchie's creation with the fro-yo and toppings of your choice - it's guaranteed to bring smiles to any get together! For a birthday, anniversary, graduation, or any special event you want to turn in to a party, order your Menchie's fro-yo cake today! 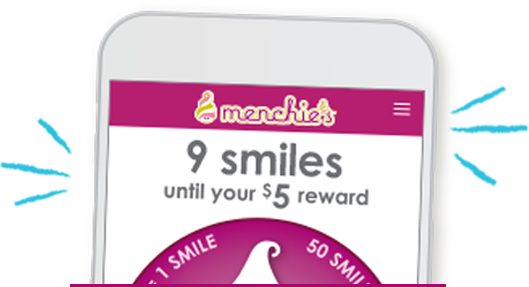 Download our new app for $5 menchie's money and double smiles for 60 days.